Dr. Steadman is a pioneering guitarist, entrepreneur, educator and author. He has taught at the University of Texas Butler School of Music, served on the faculty of Southwestern University and the Classical Minds Guitar Festival. As the co-founder and director of Orpheus Academy of Music with his wife, Wendy Kuo, he has built one of the most successful music programs for kids in the country. He is the author of The Complete Guitar and The Complete Guitar For the Older Beginner, which is used by many private teachers and as the textbook for guitar classes at colleges and universities across the US. His presentation The Student Chamber Music Project, at the Music Teachers National Association was very well received and has sparked a great deal of additional research and music which is now used in chamber music programs. His work using the Kodaly approach in private lessons has led to the creation of a method book “Adventures Through Sound,” publication in music teaching journals as well as presentations to music teacher organizations. Klondike believes that, with the right guidance, achieving musical excellence can be fun and rewarding for everyone. His achievements as a teacher and performer in the music field have made him a highly sought after instructor in the Austin area. 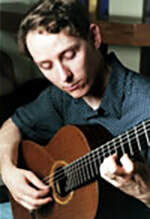 He has won top prizes in many performance competitions including the Music Teachers National Association Competition, The University of Texas Concerto Competition and the Portland International Guitar Competition. He has appeared in concerts across the United States both in recital and as an orchestral soloist. Klondike’s students have been accepted to universities as music majors and have won prestigious scholarships and competitions including the Texas Guitar Competition, the Young Artists Concert and the Asian American Challenge Cup. In 2001 Klondike founded the Educational Outreach Program for the Austin Classical Guitar Society to provide expert private guitar instruction to low income high school students free of charge. This program continues to provide quality music instruction with guitar students regularly giving public concerts as soloists and in guitar ensembles. In 2003 Klondike received the prestigious Studio Fellowship Award from the Music Teacher’s National Association for his work opening the Orpheus Academy of Music.